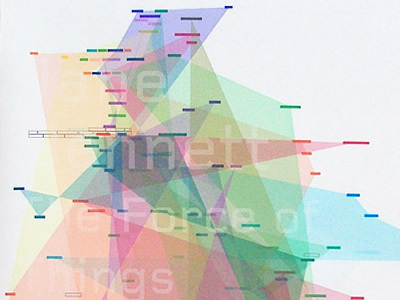 Winner of an Honorable Mention at the 2005 Adobe Design Achievement Awards, The Force of Things is a series of posters (24 x 32 inches - 61 x 81 cm) based on mapping the relationships between cited authors and referenced ideas in Jane Bennett's essay, The Force of Things: Steps Toward an Ecology of Matter. As Ian Dapot explains: "This work came from an interest in how ideas get from one place or person to another. I began by creating an Adobe PDF of Bennett's essay and spreading each page over the surface of the poster. 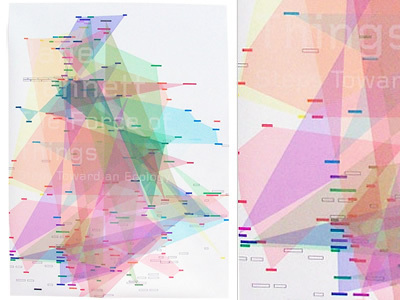 I highlighted the name of every author cited in the text and connected each reference, through line and/or areas of color. I tried to demarcate the territory of each cited author or work to show how Bennett's thinking and arguments were constructed. I tried to clarify the connections between each author and make reference to the visual language of maps. I then worked on a typographic layout for the title and masked off the intersections of the connections and the typography".